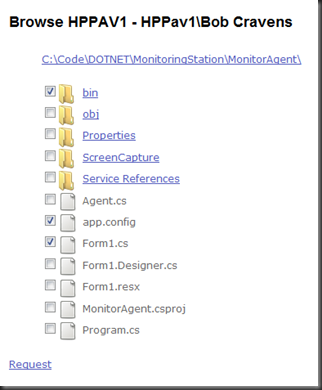 I recently posted on an application that was able to monitor the desktops of multiple remote computers. 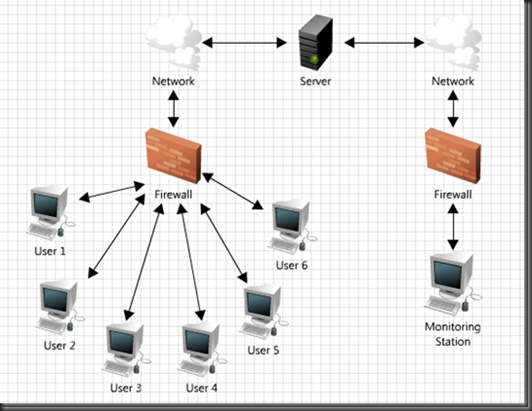 The network topology is shown below. 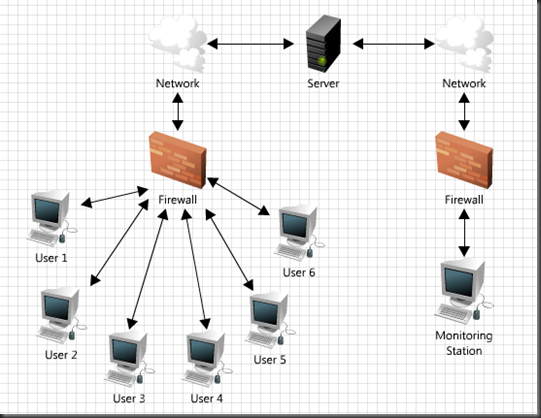 Notice that the remote computers (User 1-6 below) and the Monitoring Station are behind their own firewalls. This prevents direct communication between the devices. Instead all messages are relayed by a Server. 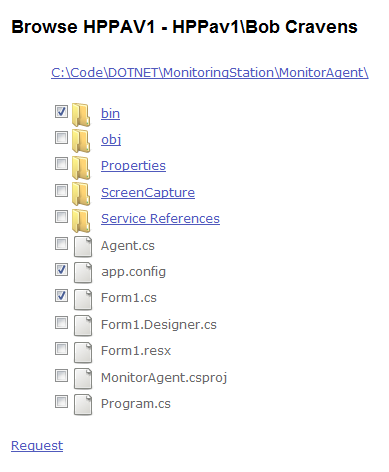 During this post, I will introduce the ability for the Monitoring Station to browse and download files from the remote computers. Here is a screen cast of the file browser at work. Fetch Current Data – Fetches the directory data (folders and files) for the current directory. 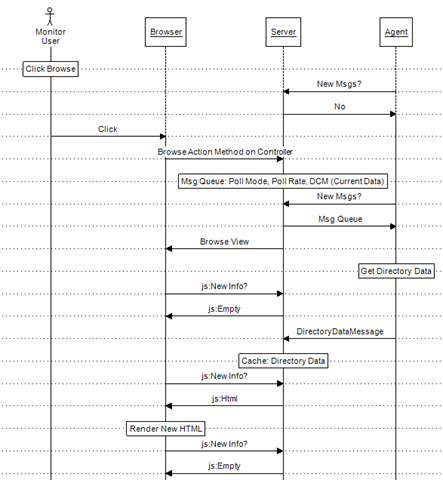 Change Directory – Causes the current directory to be changed and new directory data sent to the Server. Fetch Content – This fetches content (files or folders) from the remote machine. The ‘FileDataMessage’ and ‘DirectoryDataMessage’ messages are sent from the Agent (remote computer) to the Server. This messages contain data that was generated as a result of a ‘DirectoryCommandMessage’. 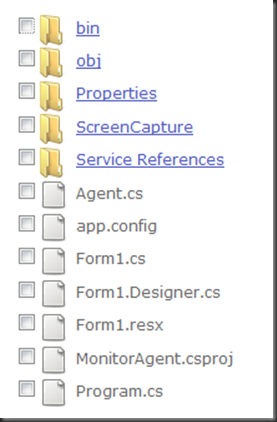 The ‘DirectoryDataMessage’ contains the current directory on the Agent and a list of folders and files in that directory. The ‘FileDataMessage’ contains the bytes (‘FileData’ property) of a zip file containing the contents requested. To better understand the communication, lets looks at the interaction diagrams that capture the file browser features. More details will follow in the code sections. The first diagram captures when the Monitor Station user switches into browse mode for an Agent. When the Agent starts, it begins polling for new messages (or commands). Many times it does not receive new messages. However, when a new message set (the server sends a queue of commands) is received the Agent acts on the commands and returns results immediately (without waiting for the next poll). The Agent communicates to the Server via a number of web services. Poll Mode – Switch to poll mode. This allows the Agent to only poll for commands. No image data is posted or collected. Poll Rate – Switch to a higher polling rate (500 ms per poll). This allows the fast response times. Directory Command Message (DCM) – To fetch the directory info (file and folder list) for the current directory. The next time the Agent polls it collects the messages in its queue and processes them. As part of processing the DCM, a ‘DirectoryDataMessage’ (DDM) is generated and sent back to the server. 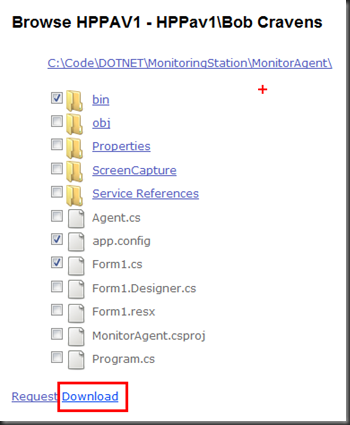 As mentioned above, the DDM has a payload that contains the directory info (file and directory list) for the current directory on the Agent’s computer. 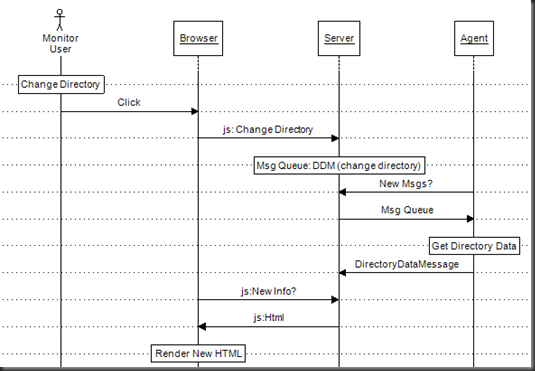 The following diagrams captures the communication that occurs for changing the current directory and requesting / downloading files. Many of the same elements are in this diagram. Although not shown, it should be remembered that the Agent is continuously polling (via web service) the Server for new messages (every 500 milliseconds) and the browser is continuously polling (via AJAX) the server for new HTML to render. In between these polling events, other Server communication (either web services or AJAX) are occurring. All of this polling should raise concerns about scalability. The domain model that I am developing for has at most 50 agents so scalability should not be an issue. The heart of this code is a switch statement that branches the code based upon the ‘Action’ sent in the message. The first ‘case’ statement processes the ‘FetchCurrentData’ option. This generates DirectoryDataMessage (DDM) using a helper method and then posts that data to the server. The Agent has a private member (_currentDirectory) that keeps track of the current directory. The second ‘case’ statement does nearly the same except it includes a bit of logic to update the current directory based upon information sent from the Server (indirectly from the Monitoring Station) before generating the DDM. The final ‘case’ statement handles the request for files. The ‘ContentToFetch’ property is a collection of paths to either folders or files. 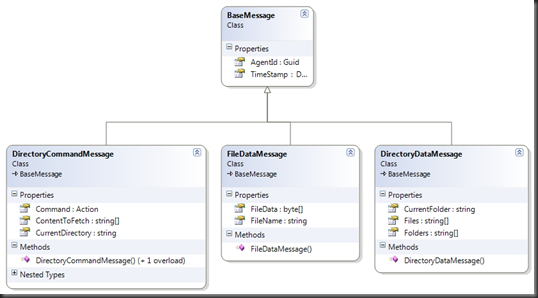 Each path is added to an archive using a ‘ZipHelper’ (wrapper around DotNetZip library). The bytes for the zip file are then added to a ‘FileDataMessage’ and sent back to the Server. // Get any messages that are queued. // Set the last update time. // Store the directory info data. // Store the file content data. 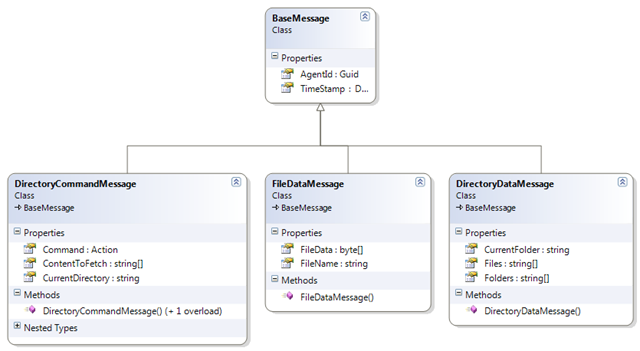 Notice that each method returns a list of messages. This is the unprocessed message queue that needs to be sent to the agent. The first method processes the ‘DirectoryDataMessage’. The first thing that happens is the Agent’s data is retrieved from an in-memory repository. Next any messages in the queue are added to the returned message list. The last update time is then set. Finally, the data from the ‘DirectoryDataMessage’ is stored. This data is later used by the MVC application to generate browsing views. The second method processes the ‘FileDataMessage’ and follows the same pattern. First the user clicks the “Browse” menu button and the following ‘Index’ action method is called on the ‘Browse’ controller. This view simply creates a list of Agents that have registered with server. Each item in the list is a link to start the file browsing for that remote computer. As can be seen above, the link routes to the “Browse” action method on the “Browse” controller and provides an ID for the Agent of interest. The following is the “Browse” action method. // Request the folder data from the computer. // Don't send any more images...only poll for commands. // Change the polling rate. // Fetch the data for the current directory. Remember that we have already requested the current directory information from the Agent by issuing a ‘DirectoryCommandMessage’. As soon as that message is processed by the Agent, the Server will have current directory information and this will be returned to the browser. Each folder in the above path is a link. 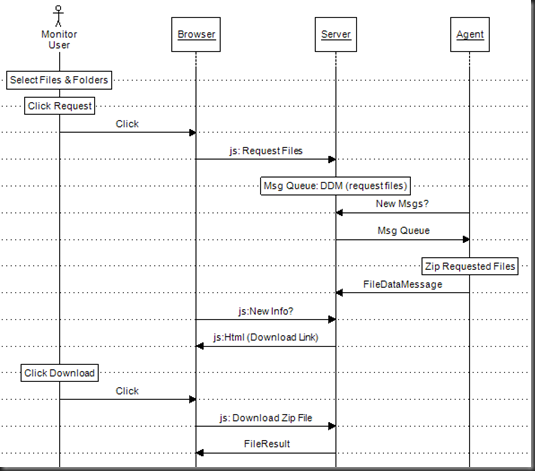 The code above includes all the functionality & implementation for the first interaction diagram. Again, this action method does not return any data to the browser. It queues up another ‘DirectoryCommandMessage’ for the agent with a ‘FetchContent’ action specified along with a list of content to fetch. The agent will then respond (see the previously covered code) with a ‘FileDataMessage’ that contains the bytes of an archive containing all the requested data. This action method returns a ‘FileResult’ back to the browser. 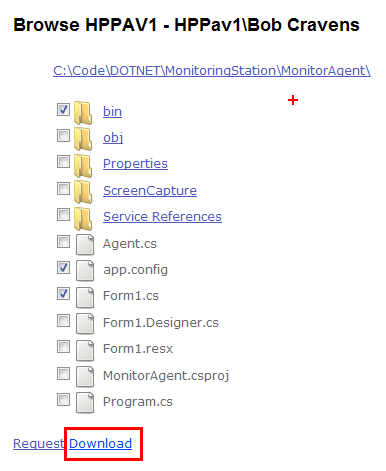 This is the MVC ActionResult that allows files to be sent to the browser. 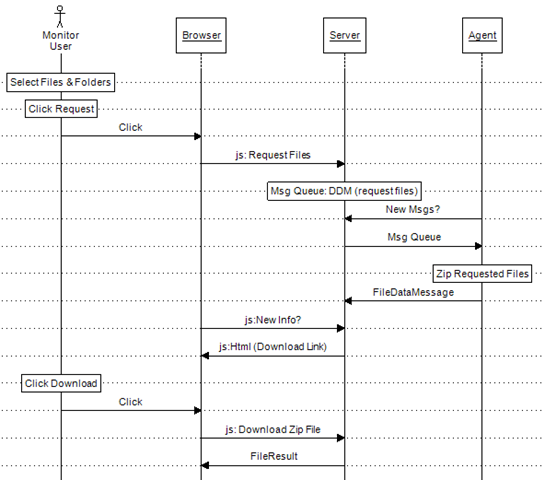 The above code places the zip file bytes (contained in the ‘FileDataMessage’) into a MemoryStream. This is passed into the FileStreamResult object as a parameter along with the MIME type. Setting the ‘FileDataMessage’ to null will make the ‘Download’ link disappear. At this point I have an Agent that can remotely monitor desktop activity and allow file browsing for multiple remote machines regardless of firewall configurations. The only network topology requirement is that the Server must be accessible by both the Agent and the Monitoring Station. I have in mind a couple of more features for this application before releasing the source code. If you have any suggestions for features or comments on the code so far, please leave them below. Thank you for every other informative website. The place else may I am getting that type of information written in such a perfect method? I’ve a venture that I’m just now operating on, and I have been at the look out for such info. I’m working on a similar project and I would love to have a look at your source code if possible, I really like your work !